Decide Where to Meet. In the event of an emergency, you may become separated from family members. Choose a place right outside your home in case of a sudden emergency, like a fire. Choose a location outside your neighborhood in case you can’t return home. Complete a Family Communication Plan. Your plan should include contact information for family members, work and school. Your plan should also include information for your out-of-town contact, meeting locations, emergency services and the National Poison Control Center (1-800-222-1222). A sample form for recording this information can be found at the Ready.gov website or at Redcross.org. These websites also provide blank wallet cards on which contact information can be recorded and carried in a wallet, purse, backpack, etc., for quick reference. Teach your children how to call the emergency phone numbers and when it is appropriate to do so. Be sure each family member has a copy of your communication plan and post it near your telephone for use in an emergency. Escape Routes and Safe Places. In a fire or other emergency, you may need to evacuate on a moment’s notice. Be ready to get out fast. Be sure everyone in your family knows the best escape routes out of your home as well as where the safe places are in your home for each type of disaster. Use a blank sheet of paper to draw floor plans of your home. Show the location of doors, windows, stairways, large furniture, your disaster supplies kit, fire extinguisher, smoke alarms, collapsible ladders, first-aid kits, and utility shut-off points. Show important points outside such as garages, patios, stairways, elevators, driveways, and porches. See illustration below. Indicate at least two escape routes from each room, and mark a place outside of the home where household members should meet in case of fire. If you or someone in your household uses a wheelchair, make all exits from your home wheelchair accessible. Practice emergency evacuation drills at least two times a year, but as often as you update your escape plan. Plan for those with disabilities and other special needs. Keep support items in a designated place, so they can be found quickly. 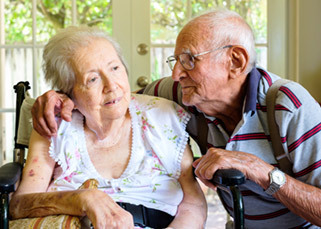 For those who have home-health caregivers, particularly for those who are bed-bound, it is essential to have an alternate plan if the home-health caregiver cannot make it to you. In advance, provide the power company with a list of all power-dependent life support equipment required by family members. Develop a contingency plan that includes an alternate power source for the equipment or relocating the person. Plan for your pets. Take your pets with you if you evacuate. However, be aware that pets (other than service animals) usually are not permitted in emergency public shelters for health reasons. Prepare a list of family, friends, boarding facilities, veterinarians, and “pet-friendly” hotels that could shelter your pets in an emergency. Know how and when to turn off water, gas and electricity at the main switches or valves and share this information with your family and caregivers. Keep any tools you will need near gas and water shut off valves. Turn off the utilities only if you suspect the lines are damaged, you suspect a leak or if local officials instruct you to do so. Be sure everyone knows how to use your fire extinguishers (ABC type) and where they are kept. Install smoke alarms on each level of your home, especially near the bedrooms. Individuals with sensory disabilities should consider installing smoke alarms that have strobe lights and vibrating pads. Follow local codes and manufacturer’s instructions about installation requirements. Also, consider installing a carbon monoxide alarm in your home. Make a record of your possessions to help you claim reimbursement in case of loss or damage. Store this information in a safe deposit box or other secure (flood/fire safe) location to ensure the records survive a disaster. Include photographs or video of the interior and exterior of your home as well as cars, boats and recreational vehicles. Also, have photos of durable medical equipment and be sure to make a record of the make and model numbers for each item. Get professional appraisals of jewelry, collectibles, artwork, or other items that may be difficult to evaluate. Make copies of receipts and canceled checks showing the cost for valuable items. Vital family records and other important documents such as birth and marriage certificates, social security cards, passports, wills, deeds, and financial, insurance, and immunizations records should be kept in a safe deposit box or other safe location.